People with disabilities now have plenty of choice about where to ski. 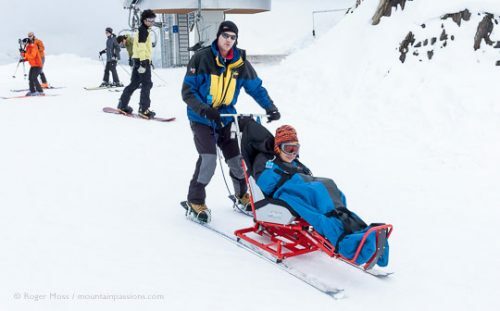 Resorts are upgrading lifts and ski school staff are undertaking specialist adaptive skiing (Handiski) training. We aim to help you make the right decisions to get on the slopes and give you a few ideas about where to go. Taking part in snowsports and experiencing the thrill and excitement of downhill skiing is now a real possibility for virtually anyone, regardless of their disability. If you’ve never skied before then it would pay to travel to the slopes already knowing what equipment might suit your particular needs. Some resort ski schools have a wide choice of equipment for beginners to try. If possible, visit a ‘snow-dome’ (such as at Castleford, near Leeds) offering weekly adaptive ski lessons. Information about these and other instruction can be found on the Disability Snowsport UK website, which is packed with information. Ski2Freedom also have a comprehensive amount of information on their website including a directory of where to ski, ideas for other activities in winter and summer, and the help that only people with direct personal experience can give. If you would rather learn and ski with a group of people, there are charitable organisations who can help. Disability Snowsport UK is a good starting point. They run activity weeks both in the UK and abroad and raise funds to help disabled people have the opportunity to travel to the mountains and enjoy the freedom and sensation of skiing. Which organisation you approach depends largely on your disability. For example, the Back-Up Trust helps people with spinal injuries. Once you have booked your lessons or have already tried out some equipment in a snow-dome then you probably can’t wait to hit the slopes. Most areas now have qualified instructors and you should enquire in advance whether they will be able to provide the instruction and equipment you need. Always book your lessons and equipment in advance. 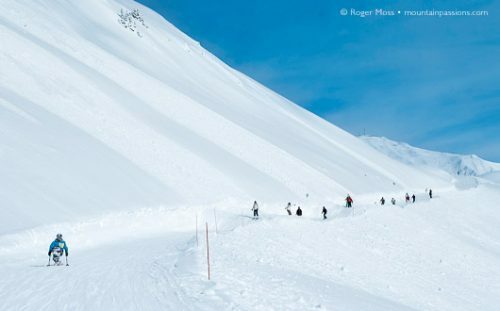 A non-beginner or intermediate skier who knows which ski equipment they need will find their choice of where to ski broadened considerably but this is beginning to change. 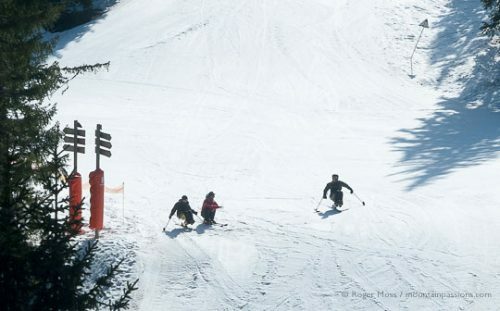 Even the smaller family resorts such as Combloux are finding they can welcome disabled skiers. This is largely due to the constant upgrades in lift infrasructure enabling sitskiers to ride the lifts and access more terrain. If you have your own equipment BagSOLO is a service that will deliver it to your destination as long as you have someone there who is prepared to receive it and store it until your arrival. Do you need adapted accommodation? French ski resorts aren’t generally perceived as being too aware of the needs of those with limited mobility. However, we can recommend some destinations which are making great efforts to accommodate disabled skiers and where some apartments and hotels have adapted accommodation. The Savoie Mont Blanc region has a comprehensive list of Handiski resorts on its website which would act as a good starting point to research places to stay. 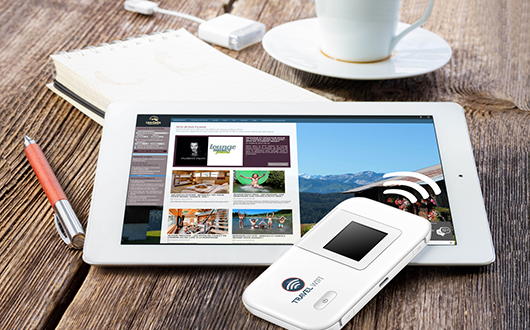 Has your chosen resort got adapted facilities? Check with someone who knows the resort, perhaps the Tourist Office, accommodation provider or your ski instructor, and find out if there are accessible toilets and restaurants in the village or on-mountain. Note where they are and inform your ski-buddy or instructor. See our To Stay… section for our selection and we also give Handiski information on our ski resort reviews. If you don’t find information on the resort you want, contact us and we’ll find out for you and share the information for others. 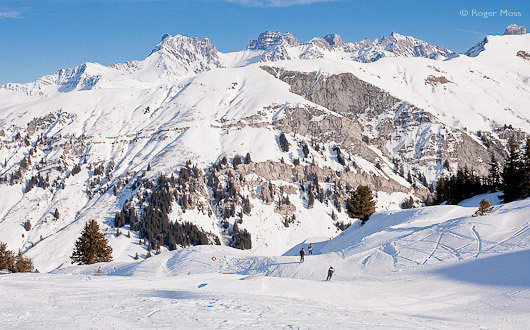 Try specialist tour operators for a complete ski holiday package. Disabled Holidays.com offer holidays in luxury adapted accommodation at Val Thorens with accommodation, equipment hire, skipasses and tuition. Travel further afield to the USA and resorts such as Breckenridge or Winter Park, Colorado (home to the National Sports Center for the Disabled) will provide everything the disabled skier could desire. Do you need a ‘Ski-Buddy’? Why pay more for your lift pass — especially if you need a Ski-Buddy? Most French ski areas will offer 50% off ski passes for a disabled skier and their ski buddy ( buy 1 get 1 free). This information is not always stated clearly on websites so it is best to contact the resort to check. 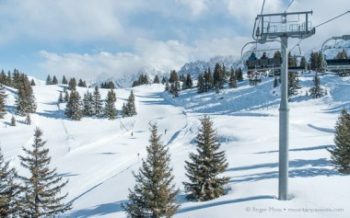 Resorts such as Avoriaz offers a second lift pass free (Portes du Soleil ski area) and La Plagne (where you can get up to 50% off the second pass) clearly states their disabled skier discounts on their website. In the Hautes Pyrénées, Luz Ardiden offers 2 passes for the price of 1 for a disabled skier and a buddy. It’s also worth noting that if you are heading to North America, Winter Park in the NSCD offers group rates and consider two adaptive skiers to be a group. If you’ve already skied and you know what equipment you require, reserve it when you book your travel — owning your own equipment will give you more independence and increase the choices of where to ski. 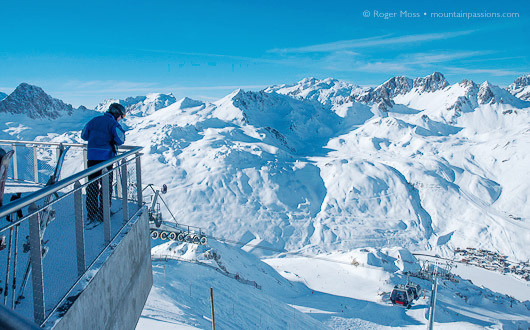 See the guide by the French manufacturer Tessier, whose website is also a wonderful source of information about skiing in France and lists many ski schools, accommodation providers and organisations on its Links page. The French ski school ESF has instructors who are specially qualified to teach standing (uniski or dualski), seated (skichair and nordic sledge), partially-sighted and blind skiers (guiding), and more and more schools are acquiring equipment suitable for disabled skiers. All ski areas are dedicated to increasing the opportunities for disabled skiers — an example being the Rhône-Alpes Region, which is subsidising the provision of specially-designed skiing equipment for the disabled (dual-skis, ski-karts etc.) for local ski schools. This equipment is then lent free of charge to ESF customers for their lessons. The prices for teaching are exactly the same as for the able-bodied. The equipment supplied is approved for use on ski-lifts, and the charge for skiing is often subject to reductions for seated skiers and their companions other than the instructor. Visit the ESF UK website and click on Handiski under Other Experiences on the menu. You will find a comprehensive guide on where you can find ESF instructors and equipment or look out for the Handiski symbol on individual resort websites. Independent ski schools often offer a more tailored service, a wider range of equipment and English speaking instructors. Many British ski schools offer disabled ski instruction— See our Resort Recommendations or visit your chosen resort website for contact details. Julia began her skiing in Courchevel and has since skied extensively throughout France and Canada. Apart from building and maintaining MountainPassions.com, she writes all the essential information for the ski and summer resort reviews and gives Twitter and Facebook followers regular updates and travel tips. Study resort websites to see if you qualify for a discount on skipasses for you and your ski-buddy. Usually, resorts that welcome disabled skiers will make this information available. 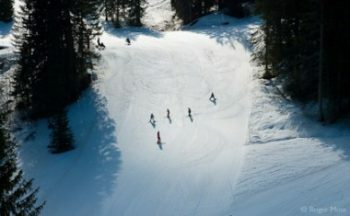 Ski schools offering Handiski lessons usually offer a ski-buddy service. Remember to carry proof of disability when you purchase your skipass. Look at our Handiski section on the resort reviews for tips on facilities, accessibility and accommodation. Contact a disabilty sport organisation if you need help or support. This may seem obvious, but outside of peak periods the slopes are quieter, less intimidating for learners. Peak times will mean less equipment available for hire. If you need to hire equipment do this well in advance of your ski holiday. If you need adapted accommodation, this may be cheaper outside of the school holidays. Information can soon become outdated - please check all offers and details carefully before booking your holiday. Its gentle downhill slopes are well suited to disabled learners and its beautiful location in the Espace Diamant, in the heart of the Beaufortain region is an added bonus. The ESF ski school has a good range of equipment (reserve in advance). We've noticed how many really good sit-skiers there were on the slopes at this pretty family resort. Situated at the entrance to the Chamonix Valley it has a reputation as one of the easier resorts in the area (which is true), but don't be put off if you are a more advanced skier, as there is plenty to keep everyone happy including the famous Verte black run used in the Kandahar FIS World Cup race. Les Houches ESF ski school offers handiski instruction and a range of equipment for tandemski, upright or seated skiing, and guided seated skiing. 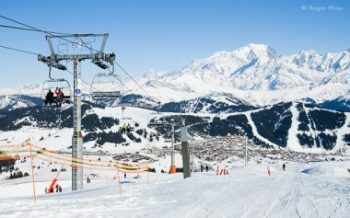 They work in partnership with the Ski Assis Evasion Association which extends throughout the Pays du Mont-Blanc resorts and offers opportunities to experience other mountain sports. This village resort, close to the famous Megève, boasts a stunning panoramic view of Mont-Blanc and a charming village landscape. The ski station is highly rated for its accessibility and services for disabled skiers. Both the ESF ski school and the Ski Assis Evasion school offer a wide range of equipment and instruction. Equipment is supplied if you take lessons from specially trained monitors at a ski school. Equipment is limited in supply and evidently needs to be appropriate for you. It is essential that you book in advance and discuss your requirements. Equipment can be hired. This depends on where you are going and the type of equipment you need. See the Useful addresses below and contact one or two organisations to find out how to borrow equipment. Probably only for the serious skier. See manufacturers such as Tessier for more information. 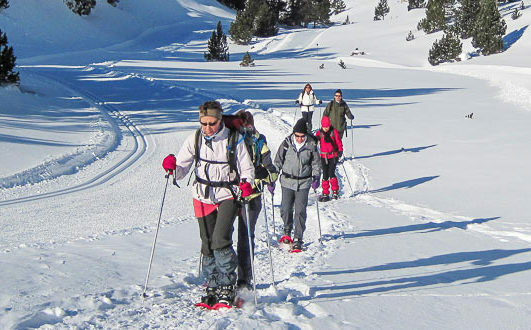 Crystal Adaptive package ski holidays specially conceived for people with special needs offers a selection of suitable resorts in Europe and USA. Savoie Mont Blanc: Search "Handiski"